Cape Gables. Case study of Kerk Straat, Tulbagh. Re: Cape Gables. Case study of Kerk Straat, Tulbagh. Thanks for a very interesting article written for the layman. We have such a rich history to explore. Thanks for the kind words. I am very pleased it is appreciated. I did not have time to complete the thread yesterday evening so here comes the rest. Now this is very special. Klipfontein. This is a longhouse – see the plan below. 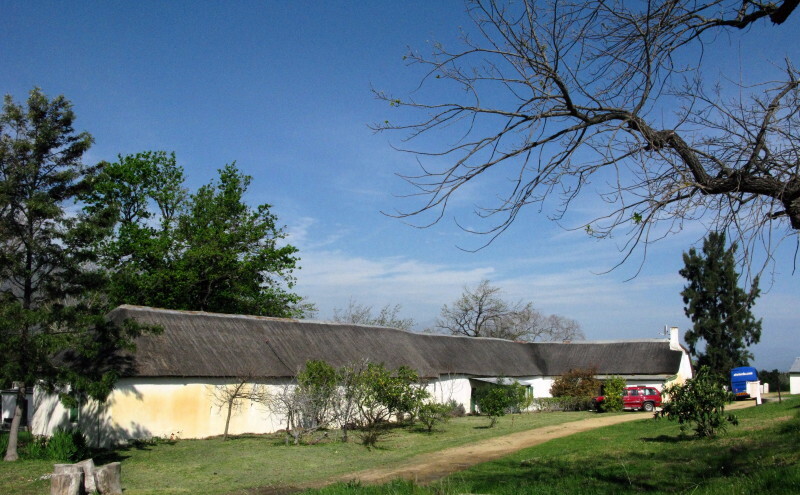 The house consists of rooms next to each other connected by doors out to the stoep and the stables & wine cellar added on to make one long building. The house was originally T shaped with the stable, fermentation room & wine cellar as a separate building. Subsequently store rooms were added almost joining up with the stables and later the small gap was also closed to create this long building. The extra bedrooms behind next to the kitchen were also later additions so it started to become H shaped but the second part of the H was never built. A very early style of building at the ‘frontier’ of the settlement. 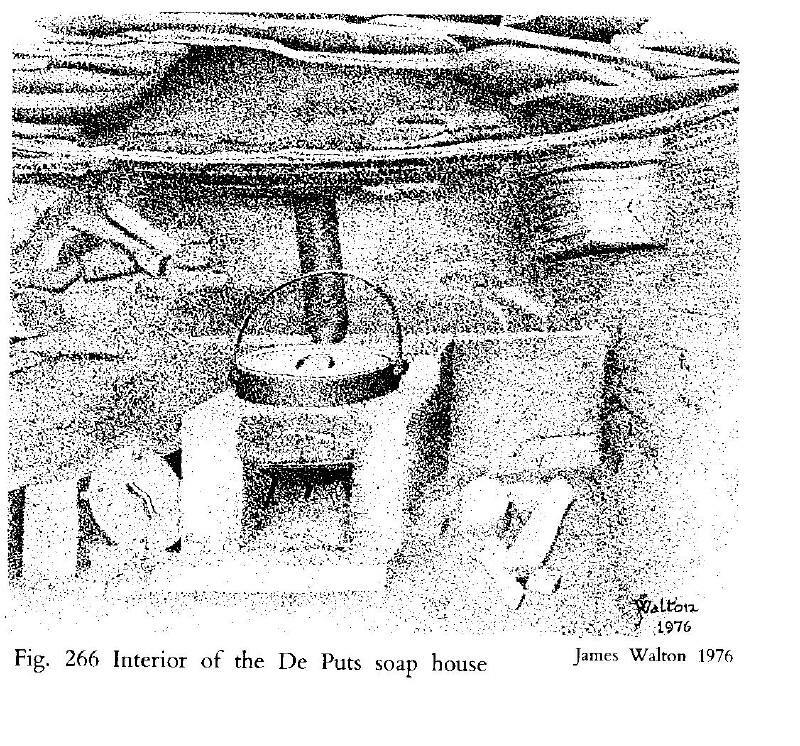 At Verlorenvlei there were several longhouses where a small original house had additional rooms added on to the side to form a longhouse. This house was severely damaged in the earthquake & the owner was advised to demolish it. Luckily he felt otherwise and restored it. It is one of the very few remaining examples of a longhouse. Private property so you can’t get to see it. Here is the back view which shows the length. The stables & cellar were probably separate originally & the gap was later filled in – notice the roofline has a step in it. 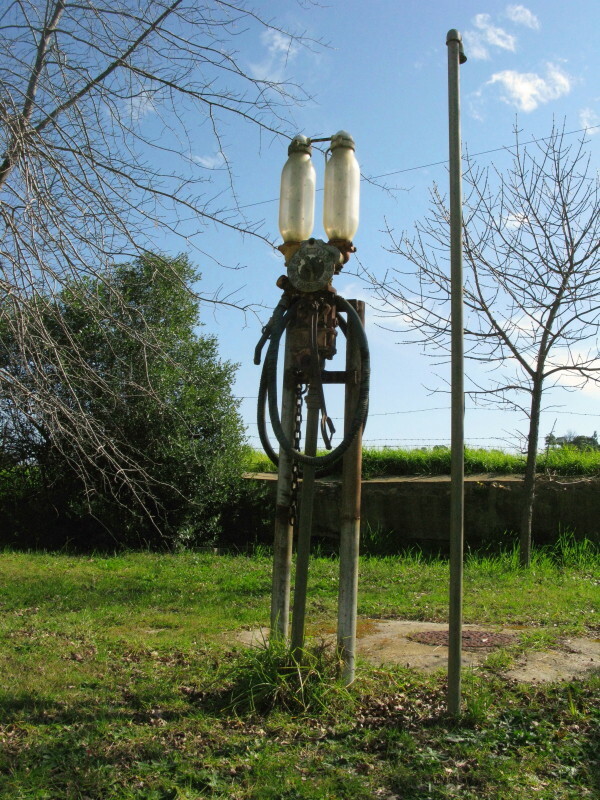 This old petrol pump is in the yard. The glass bottles were 1 gallon each, each stroke of the pump filled one and discharged the other so you could see you were not being cheated. Schoonderzicht. 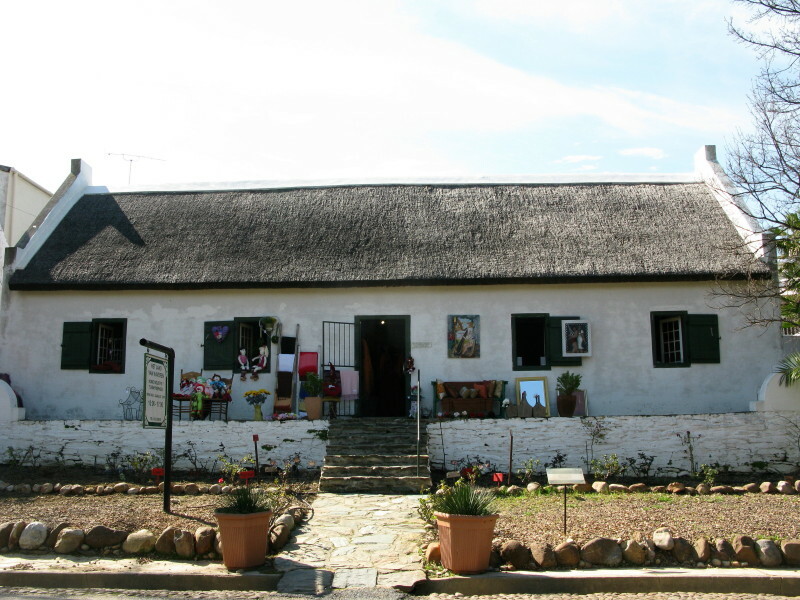 You can get to see this as they make handmade chocolates here and offer chocolate & wine tasting. Expensive stuff but absolutely top class. If you are interested in what chocolate can taste like then go there. Moniki chocolate. 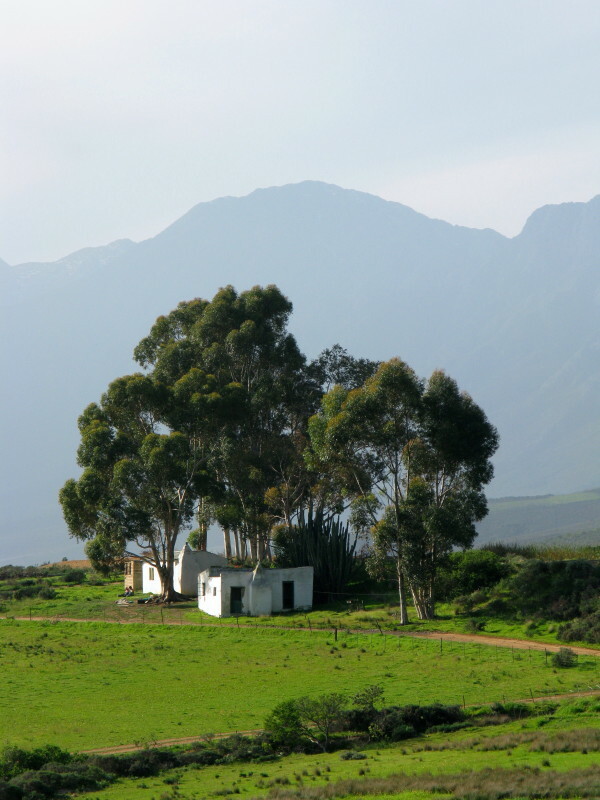 This small, T-shaped homestead with its view across the valley is one of the most charming and was among the best-preserved minor homesteads in the Cape. 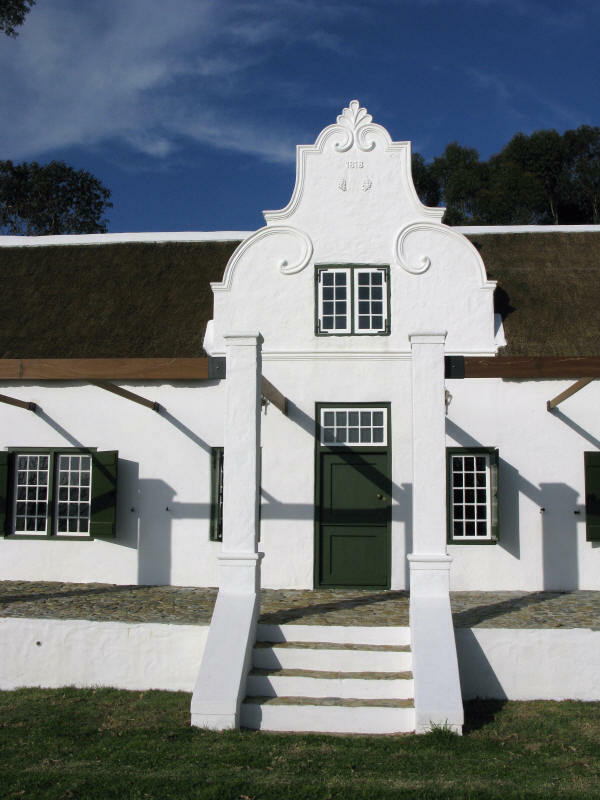 The front gable is matchless; it is holbol, with the cap split into two delicately executed scrolls with a scallop inserted, the mould of the convex curves prolonged in graceful sweeps on the gable face – a type that apparently took ten or fifteen years to penetrate to this district (see the Tulbagh Church). On the gable are simple decorations: small trees, stars, and the pineapples which occur quite frequently. The three end gables are holbol. It was subsequently restored by the owners, a brave and commendable effort, though the reconstruction of the gable lacks the finesse of the original. The date on the gable is 1795 which is the same as the corrected date on the church gable. Although Fransen writes that they are small trees he said to us that they are actually primitive vines with bunches of stylised grapes. Go and see this building if you can. 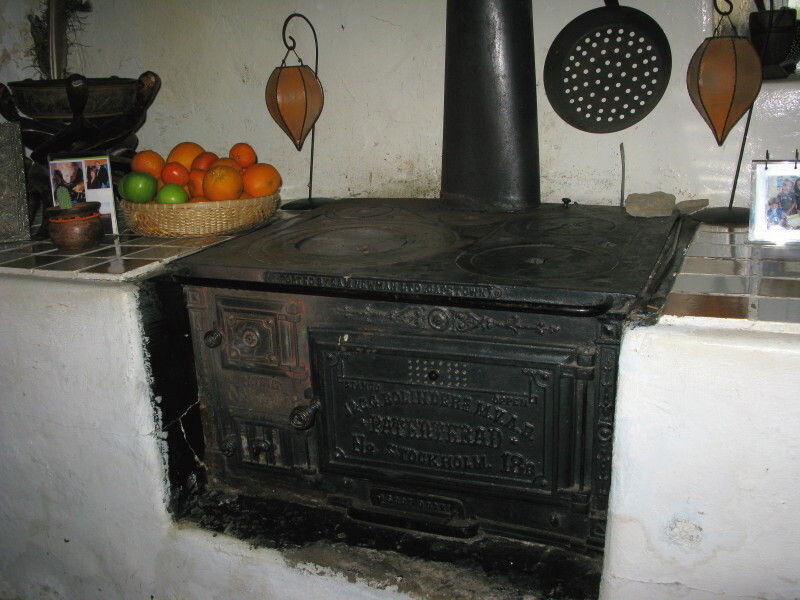 This old Swedish stove is in the kitchen. Above the handrail cast onto the front is ‘Imported by Sam Newman, Cape Town’ That is interesting because Sam Newman became a hardware shop in the WP Hardware chain. The branch in Long Street Cape Town was managed by Tom Boardman and he developed a sideline at his branch of WP Hardware (trading as Sam Newman) that specialised in kitchenware and expanded into homeware and the hardware side became less and less. The management of WP Hardware felt it did not fit in with their business so sold it to Tom Boardman who then renamed it as Boardmans. Later he got into financial difficulties and sold Boardmans to Pick n Pay and he got a job at Nedbank where he became the top man. Here is one of the side gables. Perfect holbol. 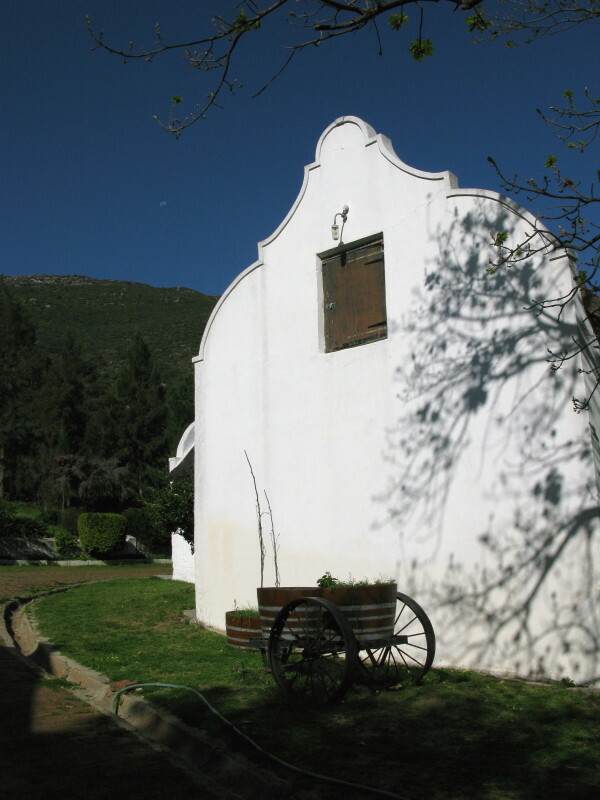 The Tulbagh earthquake of 1969 demolished the facade of Schoonderzicht, the historic dwelling of two of the authors on the slopes of the Witzenberg. The teak front door was left lying on the slate stoep somewhere beneath the pile of rubble, through which bits of the stoep bench protruded. 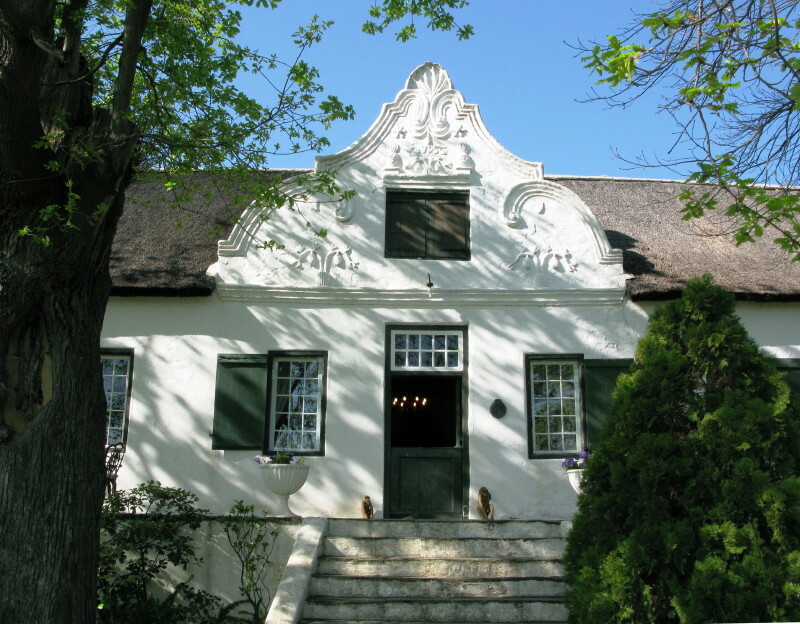 From the front garden one could see the gable-topped yellowwood and stinkwood built-in cupboard standing in the cracked back wall of the voorhuis. Had this very fine cupboard been destroyed, the owners might very well have decided against preservation of the building. We became involved in the study of the Cape interior not only through the necessary preparation before restoring Schoonderzicht, but also because we had long since noticed the links which exist between the furni¬ture, architectural woodwork and hardware of old Cape buildings. No proper conclusions could be drawn without a systematic study, and so we used Fransen & Cook’s The Old Houses of the Cape as a handbook, discover¬ing in the process that many intact interiors remained in houses where the exteriors had been altered beyond recognition. There were many surprises: even at Schoonderzicht arches were found beneath the plaster where extra doors windows and even wall-cupboards might once have been. These two men have written four books about Cape Furniture; the first was Cape Country Furniture published in 1971 – the direct result of their research before restoring the house. I said that Dr Mary Cook & Hans Fransen wrote the definitive book about our old buildings; well these men have written the definitive books about our furniture. In that quote they make great mention of how significant the built in wall-cupboard was in their decision to preserve the building. A later owner removed that cupboard and sold it. It is now in Tokai or Constantia. 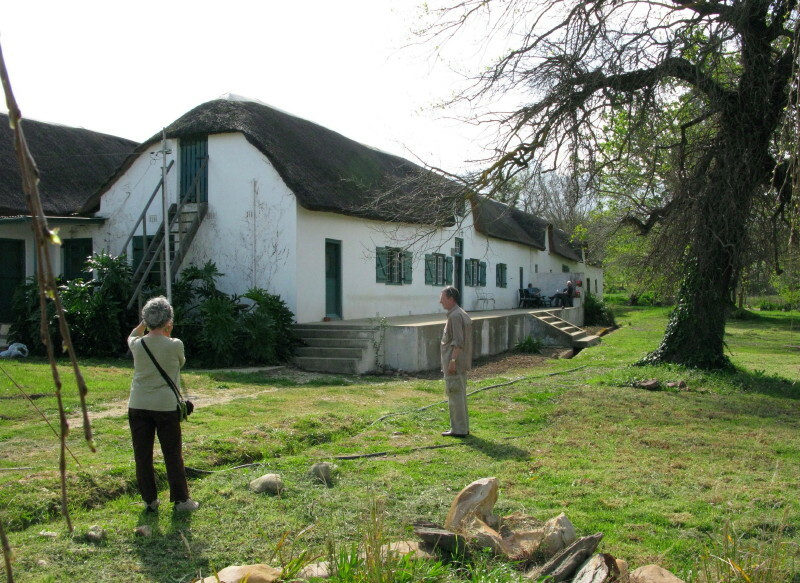 The present owners have tracked it down and want to restore it to its rightful place but may have to have a replica made (hoping that the replica can go to Tokai & the original be restored to Schoonderzicht. As an owner of a house you have the right to do with it as you please except if it is more than 60 years old when permission from the Heritage authorities is required. But as an owner of a property you have an obligation to preserve and cherish something significant like this property and what it contains. To me that owner was a barbarian. Michael Baraitser and Anton Obholzer were born, schooled and trained as doc¬tors at the Cape. Their interest in Cape furniture and architecture has resulted in two books: Cape Country Furniture which was published in 1971 (2nd edition in 1978) and, more recently (1986), The Cape House and its Interior. Both are married and between them have seven children. Michael Baraitser is a consultant clinical geneticist at the Hospi¬tal for Sick Children, Great Ormond Street, London and Anton Obholzer is a practicing psychoanalyst and Chairman of the Tavistock Clinic, London. We were told this is a raisin stove but I have difficulty believing that. A fire is made underneath and the grapes are heated in the metal dish. Raisins are a mass produced item & that little dish would take 3 or 4 fillings to accommodate just one grape harvesting basket. Anyway grapes are dried in the sun to make raisins. I think it was for making soap. If anyone has more information about them I would be pleased to know. 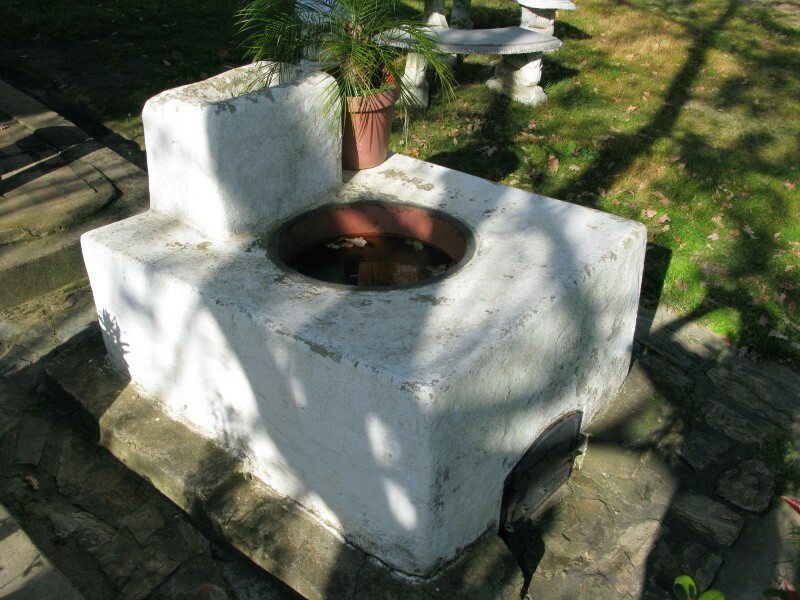 Here is a picture of a soap pot by James Walton (the founder of the VERNACS) from Old Cape Farmsteads. I would like to add some information about James Walton for he also has made a huge contribution to the appreciation and preservation of our culture. This quote is from the flyleaf of that book. James Walton, O.B.E., F.S.A., B.Sc., D.Arch. Born in Yorkshire in 1911, James Walton studied at London and Leeds Universities. He served in India and Burma during the Second World War before emigrating to Lesotho in 1947, where he was Deputy Director of Education until 1960. In recognition of his work there he was appointed an Officer of the Order of the British Empire. Since then he has lived in Cape Town where he was Managing Director of the publishing house of Longman Southern Africa until his retirement. He is well known for his pioneering studies of the vernacular architecture of many countries in Africa, Europe and the Far East. A founder and Honorary Life Member of the Vernacular Architecture Group in Britain, he is also Honorary Life President of the Vernacular Architecture Society of South Africa, of which he was also a founder member. James Walton is the author of over two hundred papers in various journals and collected works, and of several books, among which Homesteads and Villages of South Africa, African Village, Water-mills, Windmills and Horse-mills of South Africa and Cape Dovecots and Fowl-runs are the best-known in South Africa. For his services to the study of vernacular architecture he was elected a Fellow of the Society of Antiquaries of London. He also received the Cape Tercentenary Foundation's Award of Merit, the Institute of South African Architects' Architects, Critics and Writers' Award, the Gold Medal of the National Monuments Council, the Gold Medal of the Simon van der Stel Foundation and the Cape Times Centenary Medal. In 1987 the University of Natal conferred on him an honorary doctorate. Finally we went to this house which is being ‘restored’ right now. It was a simple old house where a gable has been added where there was no record of one at all. The windows are new. The gable is pure conjecture. The hols are badly misshapen in that they are much too tall with straight sides. The curve of the moulding of the bols that extends onto the face is not at all elegant because it has to tighten the curve so that it misses the window because the gable is too narrow for its height. Just compare this gable to that of Scheenderzicht at the top of this post and re-read what Hans Fransen had to say about that gable. Finally the date is 1818 which is just deception. Gawie Fagan corrected the date on the church gable to be the date when that gable was built after it had been altered to be the date when the church was first built. If the date here was 2009 it would be honest. This is #38 Kerkstraat. The house could very likely been like this without a gable at all. I appreciate that a gable is a desirable thing to add to a building but be honest about it and give it the genuine date for all to see and also proportion it so it is elegant, pretty, beautiful, handsome, plain, sophisticated, glamorous, or happy but please not a pinched sour face like that. But this little scene was to be seen nearby. I really like these simple buildings with the mountains behind. The eucalyptus trees are not local but they have become a very important part of the rural way of life locally. Those trees have contributed a lot to this country though they are despised by most conservationists. Fast growing, good firewood, very hardy and drought tolerant, good timber for posts and now even being used for cabinetmaking. Very thirsty and they rob the water from the ground around them so nothing else can grow near them. Those trees would have been perfect for roof timbers if they had been available. Spent some happy time in Tulbagh. Truly remarkable job to preserve so much. Some years ago, Leftless, Andy660 and I rode the original Roodezand pass from the Gouda side into the valley. With that being the only access back then it must have been quite a mission to get there. Thanks for a really interesting read! Love the old Cape Dutch style buildings and some really good history too. Thanks for that. It takes me back. My grand parents had a farm outside Tulbagh on Waterval farm next door to the bosbou. I was supposed to have been christened in the church but it fell down in the earth quake. My christening was conducted in a local barn. I wondered if the earthquake didn't do Tulbagh (the town, not the people) a big favour. Without it the village would have been eroded piecemeal like all the others, but with the huge restoration efforts the character of the town is better preserved. Only discovered this now, thanks for a fantastic thread. What a awesome and interesting thread, thank you for sharing.